Children of catechetical age and adults will be brought to the sacraments of Baptism, Confirmation, and Eucharist through the development, promotion, and implementation of the initiation process presented in the Rite of Christian Initiation of Adults. This liturgical rite of the church is the official norm to be followed in the initiation of adults and children who have reached catechetical age. 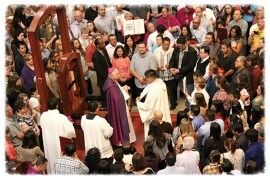 a) The Rite of Christian Initiation of Adults includes “not simply the celebration of the sacraments of baptism, confirmation, and Eucharist, but also all the rites belonging to the catechumenate.” (RCIA Introduction, #1) When the sacraments of initiation are celebrated for children who have reached catechetical age, it is assumed that they will also celebrate all of the rites belonging to the catechumenate. The Code of Canon Law states, in Can. 852, that “The provisions of the canons on adult baptism apply to all those who, being no longer infants, have reached the use of reason.” Thus, children from approximately the age of seven years to around fourteen to eighteen years are to be considered of “catechetical age.” Children, like adults, travel a journey of faith based on their spiritual progress. Various rites mark their growth in faith and culminate with the celebration of baptism, confirmation, and Eucharist. In general, children follow the same path towards initiation as adults. There is one initiation process for both adults and children.